Foods may develop a variety of brown colors, from yellow-brown to red-brown to black-brown, during handling, processing, and storage. These colors are desirable in certain foods (e.g., coffee, beer, bread, maple syrup). In other foods, such as most dehydrated fruits and vegetables, dried eggs, and canned or dried milk, browning is detrimental. Even when desirable, browning should not be excessive, as in potato chips, french fries, and apple juice. Numerous reactions lead to browning in foods. Some of these may also generate flavors and/or alter the nutritional properties of foods. Conventionally, browning is discussed as enzymatic and nonenzymatic browning. Several enzymes may initiate reactions that eventually produce brown colors in foods. For example, the action of ascorbate oxidase on ascorbic acid or of lipoxidase on lipids leads to carbonyl products that may either polymerize or react with amino compounds and form brown products. Phenolase (or phenol oxidase), however, is theprinci-pal browning enzyme. This enzyme oxidizes o-diphenols to o-quinones, which, by nonenzymatic processes, are ultimately converted to brown polymers known as melanins. Melanins are formed in both animal and plant tissues. A typical substrate of phenolase in animals is tyrosine. This amino acid is converted to melanin by a series of reactions, some of which are shown in Fig. 12. In dark hair, skin, eyes, and other animal tissues, melanin is attached to proteins. Tyrosine is also a phe-nolase substrate in plant tissues (e.g., potatoes), but o-diphenols and polyphenols are by far the most common substrates of enzymatic browning in foods of plant origin. 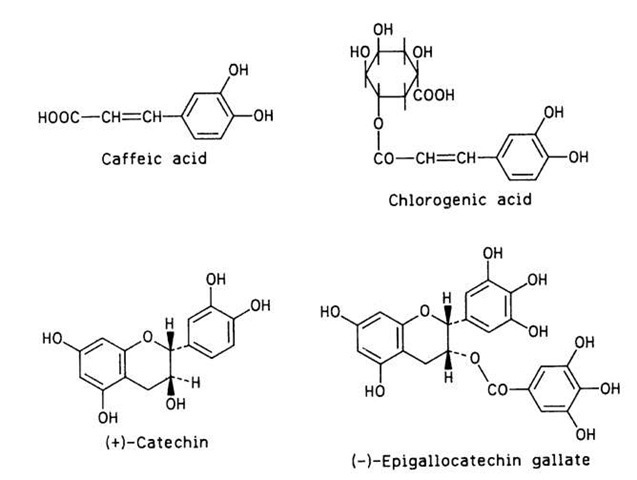 The following phenolic compounds have been associated with enzymatic browning in some foods: chlorogenic acid, caffeic acid, and catechin in apples, apricots, peaches, and pears; 3,4-dihydroxyphenylethylamine in bananas; (-)-epicatechin, (+)-catechin, (+)-gallocatechin, and (-)-epigallocatechin galate in tea leaves and cocoa beans; catechins in grapes; and tyrosine and chlorogenic acid in potatoes. The structures of four of these phenolics are shown in Fig. 13. Many fresh fruits and vegetables brown slowly as they senesce. The enzymatic browning of these commodities is more rapid when they are subjected to processing, such as the pressing of apples in making cider or the peeling and cutting of potatoes in preparing potato products. Since enzyme, substrate, and oxygen must all be present for the development of this type of browning, elimination of any one of the three agents will prevent the browning. Heat inactivation of the enzyme, the exclusion of oxygen (by keeping the commodity under water or packaging it under vacuum or inert gas), and the selection of varieties poor in substrate content or enzyme activity are ways of preventing this discoloration. Also, storage at low temperature and the addition of sulfur dioxide, ascorbic acid, citric acid, sodium chloride, or combinations of these compounds will inhibit browning. A number of chemical processes not involving enzymes may result in food browning. Briefly discussed here are the Maillard reaction, caramelization, ascorbic acid browning, and metalpolyphenol browning. This reaction is actually a series of reactions occurring from the first encounter of a carbonyl compound with an amine compound to the formation of brown pigments. It is also known as the carbonyl-amine reaction, and its brown products are often called melanoidins, indicating their visual similarity to the melanins of enzymatic browning. The most common carbonyl compounds of foods involved in the Maillard reaction are reducing sugars, and the most common amine compounds are amino acids. The intermediate reactions and their relative velocities vary with the type of initial reactants and the conditions of the reactions. Among sugars, pentoses are more reactive than hexoses, and hexoses are more reactive than reducing disaccharides. When free amino acids react with sugars, lysine appears to be the most active among them. In pep-tides and proteins, the N-terminal amino acid is the most reactive, followed by a nonterminal lysine. Raising the temperature and/or the pH accelerates the Maillard reaction. Intermediate water activity appears to maximize this reaction. FIGURE 13 Four phenolic compounds involved in enzymatic browning. Several pathways have been proposed for the formation of melanoidins through the interaction of carbonyl and amine compounds. A simplified scheme is shown in Fig. 14. This scheme involves first the condensation of a carbonyl compound (an aldohexose in this scheme) with an amine to a Schiff base via an intermediate product (not shown). The Schiff base quickly cyclizes to an N-substituted glycosylamine. Up to this step the process is reversible because the glycosylamine can be hydrolyzed back to the initial reactants. The N-substituted glycosylamine is then rearranged to an N-substituted 1-amino-1-deoxy-2-ketose, the Amadori compound, which is in equilibrium with its enol form. If the initial carbonyl compound is a 2-ketose (e.g., fructose), the corresponding N-substituted 2-amino-2-deoxy-1-aldose is formed by the Heyns rearrangement, which is analogous to the Amadori rearrangement for aldoses. The Amadori and Heyns compounds are subsequently subjected to a variety of transformations, which may include deamination, dehydration, enolization, cyclization, and degradation. The products of those reactions finally condense or polymerize with or without the participation of an additional amino compound to form dark pigments of a colloidal nature and ill-defined composition—the melanoidins. Some of the intermediate products are collectively called reductones, because they are strongly reducing compounds that account for the reducing properties of systems undergoing Maillard browning. 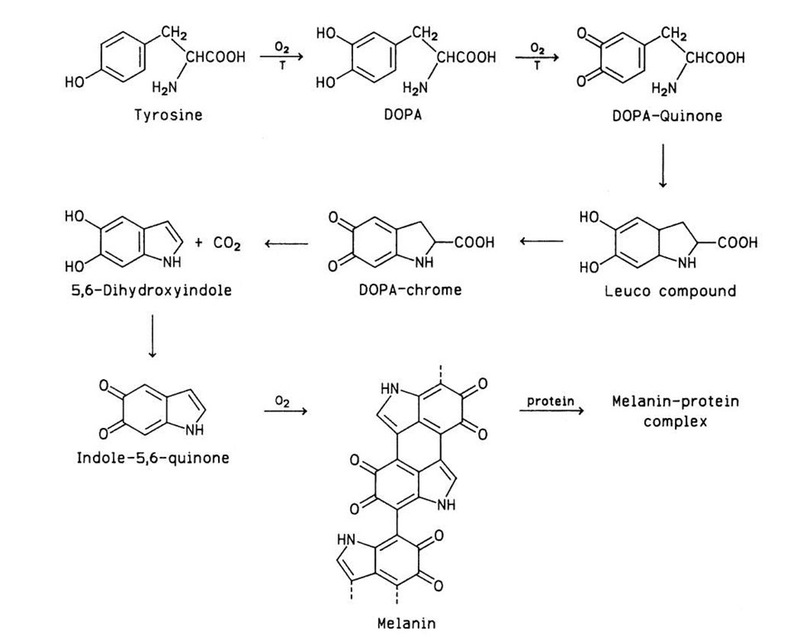 FIGURE 12 Conversion of tyrosine to melanin, catalyzed in part by tyrosinase (T). DOPA, Dihydroxyphenylalanine. It should be mentioned here that a side reaction of the Maillard browning results in the formation of flavorful compounds, such as those associated with the roasting of meat, coffee, or nuts and the baking of bread. This side reaction, known as the Strecker degradation, occurs between a-amino acids and dicarbonyl compounds and leads to the formation of aldehydes possessing one less carbon atom than the corresponding initial amino acids. The newly formed aldehydes are responsible for the pleasing flavors. 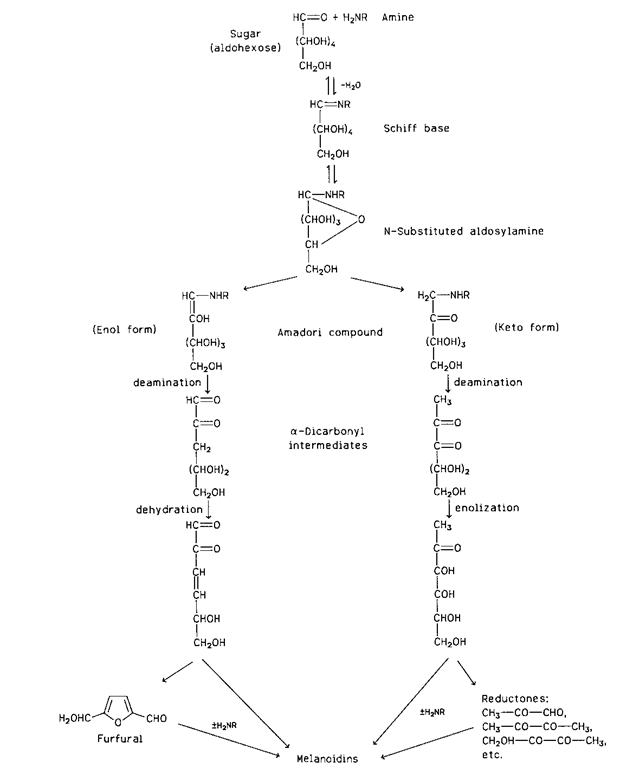 FIGURE 14 Simplified scheme of melanoidin formation by the sugar-amine reaction (± means presence or absence). A significant consequence of the Maillard reaction is the loss of the nutritional value of the amino acid involved in the reaction. If the participating amino acid is essential, and especially if it is a limiting one, as is lysine in most cereal grains, the Maillard reaction can seriously lower the nutritive value of the food. Toasting, for example, may reduce to one-half the protein efficiency ratio of bread. This reaction leads to brown products when sugars are heated dry or in solution. Certain conditions of carameliza-tion favor the formation of flavor compounds as well. The chemical transformations involved in caramelization are complex and poorly understood. They include dehydration, fragmentation, and polymerization. On the heating of pentoses, furfural is formed which polymerizes to brown products. Heating hexoses results in hydroxymethylfur-fural, which polymerizes similarly. The large quantities of industrial caramel color that are added to beverages (cola drinks), baked goods, and confections are made by heating high-conversion corn syrups in the presence of catalysts (acids, alkalis, salts). When ascorbic acid is heated in the presence of acids, furfural is formed. The latter, either by itself or after reacting with amino compounds, polymerizes to brown products. Citrus juices, especially their concentrates, develop browning, which has been attributed to ascorbic acid degradation. Polyphenolic compounds form complexes with certain metals. The polyphenols of fruits and vegetables most commonly chelate iron. The resulting iron complexes are bluish black pigments. Cutting apples with a non-stainless-steel knife results in darkening of both the blade and the cut surface of the apple. This darkening is independent of the enzymatic browning that might develop as a result of cutting. Wine makers avoid contact between the wine and iron implements because of the black iron-tannin precipitate that forms on such contact. Certain varieties of potatoes tend more than others to darken after cooking. This darkening is attributed to a complex between iron and chlorogenic acid. The iron of the tissue must first be oxidized to the ferric state for the blackish complex to appear. The stem end, which contains much less citric acid than the rest of the tuber, displays the deepest darkening. Canned or pickled cauliflower may turn dark due to the interaction of polyphenols in the tissue with iron from external sources.